The only thing I love better than binge watching a good show on Netflix is binge reading a good series. 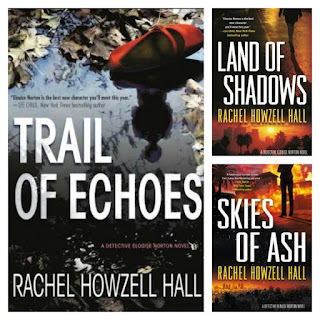 In June, a publicist reached out to me asking if I’d be interested in reading the latest from Rachel Howzell Hall, a series that focused on a black, female homicide detective in Los Angeles. I’d seen a few of my fellow book bloggers mention the author before, but since I hadn’t read the previous books in the series, I wasn’t sure if I’d be able to read the author’s latest. Lucky for me, the publicist offered to send not only the most recent book, but the backlist, as well. Readers are first introduced to tough, homicide detective Elouise "Lou" Norton in Land of Shadows. Working the homicide of a teen found strangled near a construction site brings back memories of Lou’s own sister that went missing years ago. As Lou deals with her new partner and her crumbling marriage to a video game designer, she’s on a personal mission to not only find the person or persons that killed Monique Darson, but also justice for her sister, Tori. Skies of Ash, the second book in the series, finds Lou investigating a fire-related homicide. Cheating spouses, nosy neighbors and secretive friends make it difficult for Lou and Colin, her partner, to get the job done. Though the fire could be the work of a serial arsonist, it could have just as well have been a coverup for murder. And when Lou is personally affected by the job, all hell breaks loose. My favorite of the series so far is definitely the most recent, Trail of Echoes, for a number of reasons. Lou has finally settled into her partnership with Colin, who transferred from serene Colorado to the mean streets of Los Angeles, and she’s got a new man. It’s about time she gets some happy. But just like a Shonda Rhimes character, happy doesn’t last always. Sometimes it doesn’t even last until the next commercial break. Lou’s long lost daddy turns up on her doorstep demanding her attention. Her mother is beside herself wondering what his return could mean to her new relationship. Lou is camping out at her friend’s house while going through her own divorce. And now, someone is killing young black girls with promising futures from the Jungle. A product of the low-income, crime-infested area commonly referred to as the Jungle herself, Lou takes the disappearance of these girls more seriously than the average detective. But, like I said, Lou has a lot going on herself. The friend she happens to be living with is also an editor at a local paper. She’s always trusted her friend, but can she trust her not to print articles about her case? Her new man understands her line of work, he doesn’t frown when she has to cut dates short because she’s been called to the scene of a homicide, but can she trust him to be faithful? And what in the hell does her father want? There are a lot of twists and turns in all of the Elouise Norton books. Howzell Hall definitely keeps readers on their toes and ready for more. I’ve already added the next book in the series to my to-be-read list. I just hate that I’ll have to wait until August of next year to read it. Disclaimer; Copy of books received from publisher; opinions are my own.